Let’s role-play for a minute. Imagine that you were born and raised in South Korea (fun fact: South Koreans are the 2nd hardest working people in the entire world.) You really pride yourself on your dedicated work ethic. In fact, you’re so busy working hard and being super successful at your job that you barely have time to do simple chores. And when you do manage to make time to wash the dishes or grocery shop, you are usually so tired from a day at the office that you find the task at hand tedious and frustrating. Oh, and you are always on your smartphone. Now, let’s switch it up. Imagine that you are Tesco, the #2 supermarket in South Korea. And it is your mission in life to beat out the South Korea’s #1 grocery store, E-Mart. E-Mart had more stores in South Korea. So, what are you to do? That word is important. “Do.” Messaging can be effective in persuasion, but words can’t make someone suddenly enjoy doing something that they hate. You (Tesco) have identified a problem that cannot be solved by messaging. You have to do something. 2. Don’t actually enjoy it. Tesco knew they had to find a way to make grocery shopping more convenient and less stressful! And then, there was the light bulb moment! “Wait…what if, instead of bringing the consumers to our store, we bring the store to our consumers“- someone at Cheil, Tesco HomePlus’s ad agency (probably). 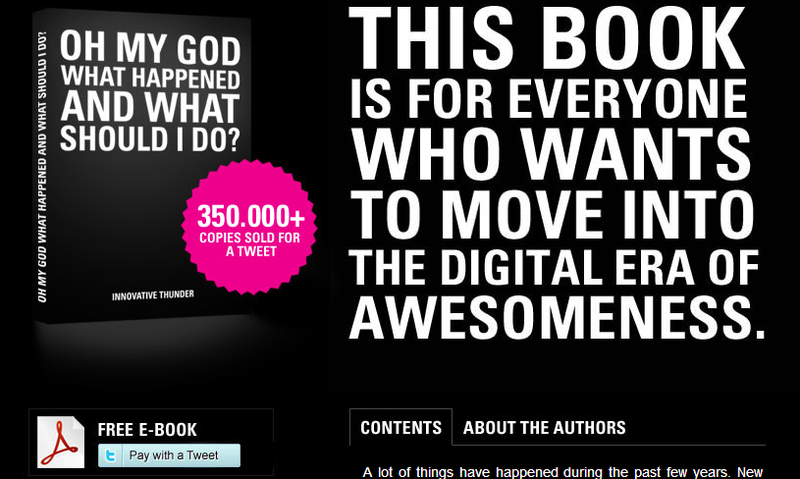 Right then, in 2011, the idea of a virtual store was born. 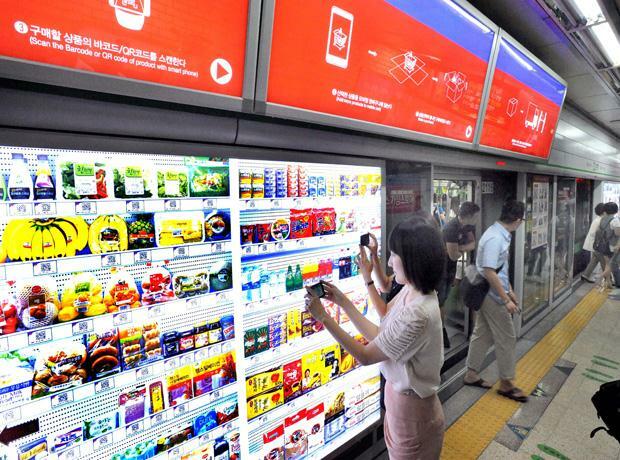 Tesco Homeplus decided to bring their grocery stores to the consumers by placing “virtual stores” in subway stations in Seoul. While commuter were waiting for their train home after work, they could scan the QR code of the items they wanted to purchase (using the smart phones the South Korean people are attached to) which would add the items to their online “grocery bag.” These items would be delivered to their house by the time they got home from work. This idea let consumers shop on the go, and turned “waiting for the time” time into shopping time. 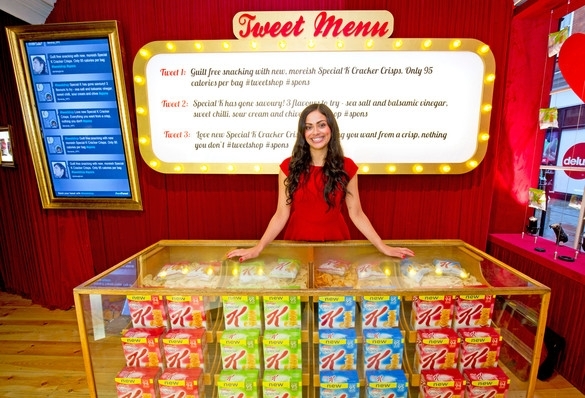 And just like Helen of Troy’s beautiful face launched a thousand ships, Tesco’s big idea launched a thousand virtual stores. But Tesco didn’t just create a virtual store. And they didn’t just create the first virtual store. 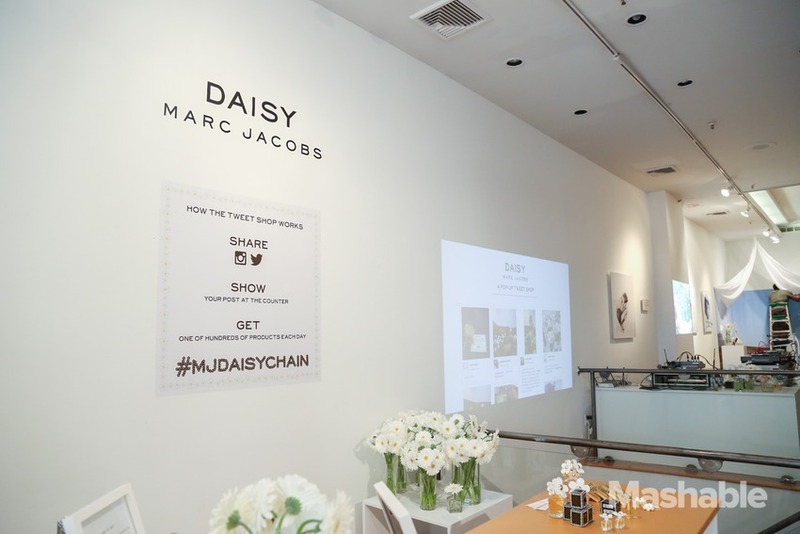 What they created was a new shopping experience: one that focused on understanding consumers and making their lives easier. And although it was a guinea pig project, it was pretty successful. 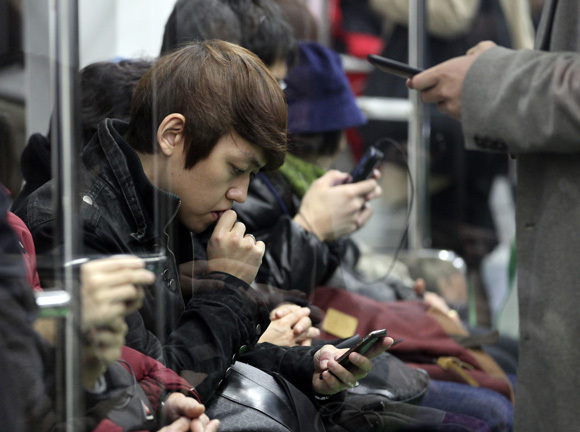 Through this campaign, 10,287 consumers visited the online Tesco (Homeplus) mall using their smartphones. The number of new registered members increased by 76%, and on-line sales climbed 130%. 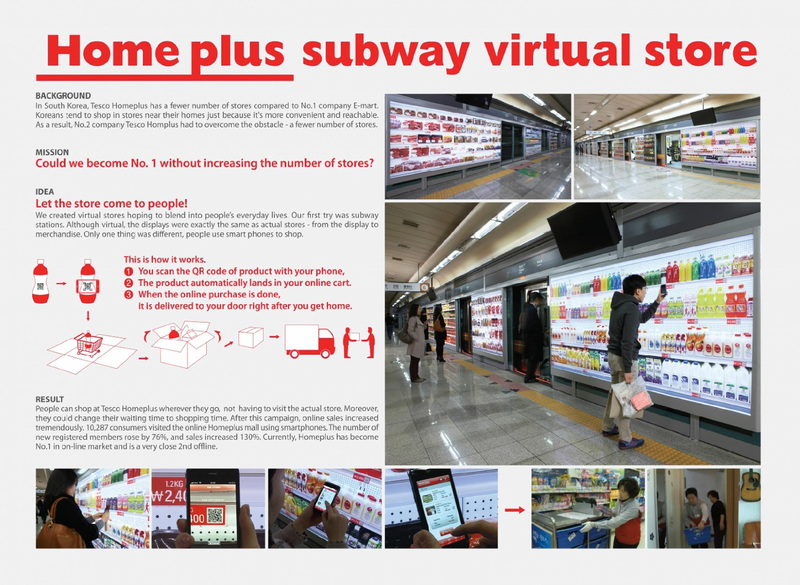 Tesco Homeplus also placed virtual stores in the UK airport in 2012, and the people couldn’t get enough! For years to come, Tesco will be remembered as the King of virtual stores. The mother of all stores virtual. It’s quite a legacy to have. Who’s jealous that they didn’t come up with this idea first?